This was also an attempt to use my DSLR more so I can justify upgrading my body from an A100 to a A700. I’m still happier using film, but sometimes I need that instant gratification – but do I need £600s worth? 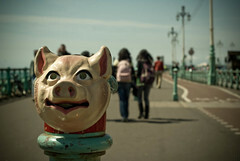 This entry was posted in Photography and tagged alpha, brighton, swine flu. Bookmark the permalink.